From Christmas through the month of March, an icy and snowy winter caused havoc with the scheduled monthly meetings of the Secular Augustinian Recollects here at Saint Cloud Monastery. The first meeting of the year 2015 was the Day of Recollection held on March 14 at Tagaste Monastery, Suffern, New York. The members of the Secular Augustinian Recollects of Saint Cloud Monastery Chapter joined those of Tagaste Monastery to hear the talks by Father John Gruben, OAR, and Father Charles Huse, OAR. Father John gave the presentation on the Year of Consecrated Life. Father Charles, citing passages from “Lámparas de Barro,” urged all to “cast off the old man; only new men can learn the new song and be renewed from their old age by grace.” Following the talks were the Stations of the Cross, led by Father Fredric Abiera, OAR, the Holy Eucharist, a delicious supper, and fruits of a Saint Joseph Table. The meeting for the month of May was quite special. Following the recitation of the Holy Rosary and the Litany of Saint Rita, roses were blessed and distributed in honor of the feast of Saint Rita of Cascia. Members and guests enjoyed the delicious treats and one another’s company. The culmination of our Secular Augustinian Recollects’ calendar year was held at Due Amici Restaurant in West Orange, New Jersey, with a luncheon on June 6th. It was well- attended by Father Fredric Abiera, OAR, Spiritual Director of the SARs of Saint Cloud, Father Charles Huse, OAR, Father John Gruben, OAR, from Tagaste Monastery, Peggy Evans (member of the SAR at Tagaste Monastery), and 17 SAR members and guests. On January 6, 2015 the friars joined the Mary Star of the Sea community for the retirement Mass and dinner for long-time Mary Star of the Sea Parish secretary, Mrs. Terry White. She was parish secretary all the thirty-plus years that the Augustinian Recollects have staffed Mary Star of the Sea Parish in Oxnard and knows many of our friars. February 24, 2015 the Spanish SARs celebrated the Rite of Admission to the Candidacy Period during a special Mass presided by Fr. Domingos Machado, OAR, Prior. The evening Liturgy of the Eucharist was followed by a festive gathering in the refectory. This group of 22 candidates is the first group of Spanish speaking SARs here in Oxnard. On March 18, 2015, the Priory celebrated the Vigil of St. Joseph with Mass at 6:00 PM during which the new officers of the St. Ezekiel Moreno Guild were installed. Following the liturgy a dinner was held for all those who help the Priory in various ways. The Priory priests helped this spring with confessions and Masses at Mary Star of the Sea and several local parishes, convents, and the naval base. Weekend vocation retreats were held in February, March, April, May, and June. In March Father Ramon Gaitán, OAR, was transferred full-time to the Priory and at the end of May, Deacon Ramiro Muñoz, OAR, joined the Priory community, too. On Palm Sunday Father Domingos Machado, OAR, led the traditional procession and presided at the Mass. The friends of the community had worked very hard to decorate the shaded walkways with an abundance of palm branches. The community joined the Easter Triduum liturgies at Mary Star of the Sea Parish, while Brother Anthony Torretti, OAR, helped at Cristo Rey Parish during Holy Week. On Holy Thursday, to celebrate the institution of both the Eucharist and priesthood, we invited our brothers from Mary Star of the Sea to join us for a special dinner at the Priory. Holy Saturday, prior to attending the Easter Vigil at Mary Star of the Sea, we enjoyed an anticipated Easter meal with Priory volunteers. Throughout April, May, and June many parts of the Priory were repainted, carpets shampooed, and the electric gate at the monastery entrance repaired. In addition, just in time for the celebration of the 25th Anniversary of the Dedication of the Chapel of Our Lady, the tabernacle was refinished, thanks to the very generous support of local donors. This tabernacle is originally from St. Augustine Monastery in Kansas City, Kansas and it truly gleamed for the June 18, 2015, anniversary Mass. Priory landscaping had also been embellished and countless other jobs completed thanks to the many volunteers who dedicate their time and talents to the Priory. On April 12, 2015, Father Frank Wilder, OAR, conducted a retreat day for the English SAR Fraternity. The day included a Mass at which two new members made their promises. The Priory celebrated the 50th Anniversary of profession of Brother Anthony Torretti, OAR, on April 22, 2015. Father Joseph Gallardo, OAR, Prior Provincial, presided at the 11:00 AM recitation of Midday Prayer, which included adoration of the Blessed Sacrament, chanting of the Sequence to St. Augustine, renewal of vows by all the Recollect Friars present, and concluded with Benediction of the Most Holy Sacrament. Father Michael Stechmann, OAR, and Father Eric Crelencia, OAR, beautifully chanted the Sequence. In addition to the friars from the various Augustinian Recollect communities, Brother Anthony's brother Ronald and sister-in-law Suzanna, cousins from Pennsylvania and California, one of his former students at Donnelly College in Kansas City, Kansas, and parishioners from Mary Star of the Sea, Cristo Rey, and St. Benedict's also attended the chapel service and dinner. Both in the chapel and in the refectory we publicly thanked Brother Anthony for his example of faithful service to God, the Province of St. Augustine, and so many others. Indeed a golden example. THE ANNUAL APPEAL of the Archdiocese of Los Angeles for 2015 developed the theme of “Be Imitators of Me,” from St. Paul’s letter to the Corinthians. Fathers Michael Stechmann, OAR, and Juan Jose Guzman, OAR, attended an orientation session in mid-January to keep informed as to the scope of the appeal as well as specific changes for recording of donations that were initiated this year. The Annual Appeal, “Together in Mission,” provides for necessary funds for parishes and schools within the Archdiocese. The Announcement Weekend came early in February at all of the Masses to encourage participation, and Commitment Weekend was held February 14/15 with the “in-pew process” at all of the Masses. Thanks to the generosity of Cristo Rey parishioners, we were able to reach our goal on the first weekend because of direct mail solicitation from donors in previous years and new pledges gathered at each Mass. By the following weekend, we were able to exceed our goal in pledges and in payments with congratulatory letters received from the Archdiocese of Los Angeles. RELIGIOUS JUBILIARIANS were invited to attend a special liturgy at the Cathedral of Our Lady of the Angels on January 25, 2015. Father Michael Stechmann received an invitation as he had celebrated 40 years of religious profession. At the end of the Mass, jubilarians were acknowledged in groups and there was special recognition for the Augustinian Recollects who have served Cristo Rey Church continuously for these past 75 years. Archbishop José Gomez and Father Michael Stechmann, OAR, at the reception following the Mass for religious jubilarians. Father Michael Stechmann, OAR, and Father Frank Wilder, OAR, were invited to stand as the Augustinian Recollects were acknowledged for their years of service in the Archdiocese. AN ORGAN CONCERT was held in the church on Sunday, February 15, with a guest organist and vocalist presenting familiar and classical hymns in honor of Mary. This was one of the activities for the parishioners that had been planned in conjunction with the 75th anniversary of the parish. Prior to this, one of the parishioners made a generous donation to repair pipes and for necessary restoration of the organ. During the process of repair, we learned from the serial number that the organ was originally built for St. Alphonsus Church in Los Angeles in 1940; however, information as to the date and installation in our church is not recorded. Immediately following the concert, the Guadalupanas and representatives of other parish groups hosted a joint birthday celebration in the parish hall for Father Michael Stechmann and Father Juan Jose Guzman. The parishioners were pleased to meet Father Juan Jose’s parents who had arrived from Mexico for a visit. A LENTEN MISSION, directed by Brother Mauricio Torres of the lay movement "Totus Tuus" was held in the parish on the evenings of March 3-5. There was a good response from the parishioners; this activity coincided with the parish anniversary. Attendance at the mission grew, and the final evening included the Consecration of homes to the Sacred Heart. The ornate Gothic vaults of Sacred Heart Cathedral Basilica in Newark, New Jersey, echoed to the Easter hymn “Alleluia! Let the Holy Anthem Rise” at a noon Mass on May 17, 2015, as Fra. George Valdivia and ten other men received the Order of Deacon from Archbishop John Joseph Myers. Coadjutor Archbishop Bernard Hebda of the faculty of Immaculate Conception Seminary and a great many priests concelebrated, including Fr. Joseph Gallardo, OAR, Prior Provincial of St. Augustine Province, who also vested Fra. Valdivia, as well as Frs. Fredric Abiera, OAR, Michael Rafferty, OAR, John Gruben, OAR and John Oldfield, OAR. The Cathedral was filled with family members, friends of the deacon candidates, seminarians and members of various religious congregations. Several of our SAR members from the Tagaste Monastery fraternity and a good contingent from the Hispanic Community of Tagaste were also present, as were several members of Fra. Valdivia’s family, including a brother and nephew. After the opening procession and the welcome, the readings in English, Spanish, and Portuguese followed. The Archbishop then called on the candidates to make a commitment to celibacy and a promise of respect and obedience to the bishop. Following the solemn singing of the Litany of the Saints, the Archbishop laid his hands on the head of each of the candidates and then prayed the Prayer of Ordination. After the vesting of the new deacons, the Archbishop handed each the Book of Gospels with the traditional words: “Receive the Gospel of Christ, whose herald you have become. Believe what you read, teach what you believe, and practice what you teach.” Some of the current deacons then embraced the newly ordained, and the assembly signified its approval with an animated round of applause. All of the new deacons helped with the distribution of Holy Communion to the faithful. Following the recessional, there was time for greetings and picture taking. Deacon Valdivia then had an opportunity to spend some time with his family, and Fr. Provincial invited the community to a very satisfying lunch. Our congratulations to our new Deacon who will be spending the summer exercising his ministry in a parish of the Archdiocese before returning to the seminary in the fall for his final year of theological studies. Archbishop Bernard Hebda (c) joins Recollects (l to r) Frs. 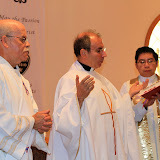 Michael Rafferty, and Fredric Abiera, Deacon George Valdivia, and Frs. Joseph Gallardo (Prior Provincial), and John Oldfield. Fr. Joseph Gallardo vests Deacon George Valdivia with stole and dalmatic of his new ministry.